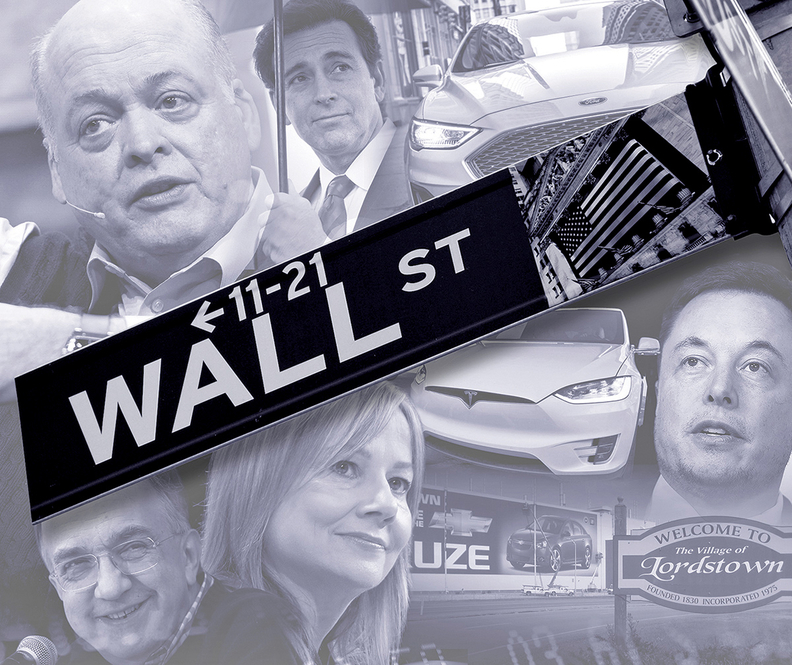 Can car companies ever win on Wall Street? Ford Motor Co.'s stock price has vexed Executive Chairman Bill Ford for years. At the company's 2015 shareholders meeting, the first since Mark Fields succeeded Alan Mulally as CEO the previous summer, Ford admitted he watched the shares fluctuate daily — and sometimes hourly — but believed the issue ultimately would "take care of itself." The stock fell 1 percent that day, to $15.27. Two years later, Ford Motor shares were worth less than $11, and Fields was out. Bill Ford touted his new CEO, Jim Hackett, as a "visionary" who would speed decision-making, in part to convince Wall Street that the automaker has a clear plan. But on Hackett's watch, Ford stock, down 37 percent under Fields, has slid 20 percent more. It dipped as low as $7.41 in December. That Ford seemingly can't win over Wall Street punctuates the challenges legacy automakers face in inspiring confidence among an investment community that's only growing more skeptical as a market downturn looms. Major disruption from electric vehicles and autonomous vehicles is pushing auto stocks further out of favor. "The domestic automakers have always been underloved and underowned," David Kudla, CEO of Mainstay Capital Management in Grand Blanc, Mich., told Automotive News. "The way to perform the way Wall Street wants you to is to get results. It's not about headline-grabbing news or things that give the stock a short-term bump. It's about five-year plans and a winning strategy that instills confidence in your employees and shareholders." Over the past five years, General Motors and Ford have underperformed the broader stock market, even after accounting for the relatively generous dividends they pay shareholders. But it's not just those automakers. Even Tesla — which the market values at some $20 billion more than Ford — has yielded returns less than 10 percentage points greater than the Dow Jones Industrial Average since January 2014. The best-performing U.S. automaker over that period has been Fiat Chrysler Automobiles, whose shares had more than tripled before giving back some of those gains over the past 13 months. For all of the bold actions that GM has undertaken — exiting unprofitable markets, cutting salaried workers, buying back shares and investing in self-driving and electrified vehicles — its stock has remained stagnant. Investors ask, " 'Why should I buy GM now if we are going to have a recession in the next 12 to 24 months?' " Morningstar analyst David Whiston said. " 'Instead of buying GM in the high $30s, maybe I can buy GM in the mid-$20s.' "
A decade after its bankruptcy, GM is executing on its plans, with Wall Street as a chief constituency. It seeks to become "the world's most valued automotive company," as stated in its annual report released this month. In the past several years, GM has restructured its operations in North America, South Korea and South America and exited underperforming markets such as Europe and South Africa. It also ended manufacturing in Australia. Those are in addition to GM buying back 510 million shares of common stock for a total of $16.4 billion since 2012 and significantly increasing its investment in emerging technologies such as autonomous and electrified vehicles. Investment in unprofitable yet promising technology segments has been the only action to positively affect GM shares for any sustained period. In October 2017, shares rallied to a new high of more than $45 on GM's plan to launch at least 20 new full-electric or fuel cell vehicles globally by 2023. The shares then ebbed before again rallying in May 2018 on Japan's SoftBank Vision Fund announcing a $2.25 billion investment in Cruise in a deal valuing the subsidiary at nearly $15 billion. GM paid less than $1 billion for Cruise two years earlier. The cost-cutting measures trimmed $6.5 billion from GM's balance sheet from 2015 to 2018, and the company expects to cut $6.5 billion more on an annualized run rate by 2020. "We are really repositioning this company from one that was trying to be all things to all people and all markets to a very strategic, agile and profitable company," Mary Barra, GM's CEO since January 2014, told investors this month. "And we believe we are in a very differentiated position than many of the competitors in this industry." Despite the actions and record profits, some investors continue to doubt the automaker's ability to navigate through a recession and any significant dip in vehicle sales. If GM shows strength as the market fades, its shares could be $50 or $60 "pretty easily," said John Murphy, managing director of automotive equity research at Bank of America Merrill Lynch. "The huge skepticism is that the ills of the past will come back in. Investors are really waiting to see the trajectory of the earnings decline," Murphy said last month at the Automotive News World Congress in Detroit. "People want to see that downturn. It sounds like a perverse logic, but the downturn will be really positive for their stock." Shares of U.S. automakers have been stuck in neutral amid skepticism over their future prospects and the looming potential for a downturn in sales. This chart shows how the companies' shares have performed relative to their value at the start of 2014, a year when General Motors and Ford both got new CEOs and Fiat completed its merger with Chrysler. GM has said it can remain profitable if total U.S. light-vehicle sales plunge to between 10 million and 12 million, as they did a decade ago during the Great Recession. Across town, Ford has been piling up huge profits as well, but its shareholders have even less to show for it than GM's. In January 2016, Ford posted its largest-ever pretax annual profit, and Fields vowed to "accelerate our pace of progress even further" to "create value for all of our stakeholders." But those stakeholders either didn't believe him or weren't impressed; Ford stock dropped 1.2 percent that day. Hackett's moves since taking over in May 2017 — eliminating salaried jobs, dropping money-losing sedans and partnering with automakers and software companies in cost-saving alliances — have yielded similar results. Analysts say they need more details from Hackett as he nears the end of his second full year at the helm. Moody's Investors Service last year downgraded Ford's credit outlook to negative from stable, saying the automaker had "allowed an erosion in many of the operating disciplines that it established following the 2009 restructuring of the North American auto sector." The company is now amid a global restructuring and plans to cut an undetermined number of white-collar workers by the second quarter. Over the past four years, Bill Ford's tone has changed from frustration to resignation that the share price might not improve the way he had hoped. "Everybody loves the shiny new thing, and that's not a 115-year-old automaker," Ford said last month at the Detroit auto show. "It's a hard story because we're in transition. I think a transition story is hard to tell and hard to understand. We're having to sort of say to people 'Take our word for it.' But analysts have models they have to create, and taking our word for it doesn't fill out a model." Kudla said Hackett's slowly developing plan has hurt the company's perception with investors. "Wall Street wants to have confidence in that man at the top," he said. "You need a message and a path that you can rally the troops around." Despite the uncertainty, executives believe that message is finally taking shape. While most of Ford's major announcements during Hackett's first 20 months on the job have left investors wanting more, he promised 2019 will bring some clarity. Product decisions in North America should help improve profits here as executives work toward their goal of returning to 10 percent margins in the region. Elsewhere in the world, Ford is beginning its second European restructuring in a decade, and likely will announce plans this year to transform its struggling South American operations. 2014 was a tme of transition for U.S. automakers. Here is a look at what has happened since then. Tesla's stock, once among the darlings of Wall Street, finds itself in a prolonged stall. Since hitting a high of $383 a share in June 2017, the stock has whipsawed, tumbling as low as $259 in October. Even CEO Elon Musk, who had befuddled Detroit auto executives as Tesla stock surged in previous years, has expressed frustration with the fickleness that comes with public ownership. For years, investors treated Tesla like a fast-growing technology company rather than an automaker, and its valuation reflected it. In spring 2017, Tesla's market capitalization surpassed GM's, making the California upstart the most valuable domestic automaker. "Tesla doesn't trade on fundamentals," Morningstar's Whiston said. "It trades on the cult of personality that is Elon Musk and on what it may look like 10 to 20 years from now." Musk's cult of personality is showing signs of erosion. Tesla's stock is under pressure from Wall Street, which is demanding the automaker consistently deliver on its profitability and production promises. Meanwhile, Tesla has attracted a legion of short sellers who believe the shares are overvalued. Tesla's stock stall is a reflection of investor frustration with the pace of the Model 3 rollout and the "erratic behavior" of its CEO, Whiston said. "Elon's behavior last year raised a lot of questions and made people realize there's a lot more risk to investing" in the company, the analyst said. Perhaps the most startling example occurred last summer, when Musk announced on Twitter his intention to take Tesla private with an infamous declaration: "Funding secured." The tweet, which proved both reckless and inaccurate, derailed any privatization plans, led to a $40 million settlement with the Securities and Exchange Commission and cost Musk his chairman role. As a public company, Tesla stock is subject to wild swings that can be a major distraction for the company, Musk wrote in an August 2018 blog post. "Being public also subjects us to the quarterly earnings cycle that puts enormous pressure on Tesla to make decisions that may be right for a given quarter, but not necessarily right for the long-term," Musk wrote. "Finally, as the most shorted stock in the history of the stock market, being public means that there are large numbers of people who have the incentive to attack the company." Fiat Chrysler Automobiles is approaching the future at its own pace. And its stock has outperformed that of its rivals — even beating Tesla's returns — since 2014. Ford and GM got off to quicker starts in areas such as electrification, mobility and autonomous technologies, evolutionary categories in which the companies have been proactive forces. FCA, with a shorter budget and under the guidance of then-CEO Sergio Marchionne, lagged behind them in those areas over the years as it focused on producing record sales from Jeep and Ram. Plus, FCA has been slow to pull the plug on vehicles well past their prime if they're still hauling in big profits. The automaker has generated sizable revenue from older models, including the Ram 1500 and Jeep Wrangler, while selling them alongside their newer counterparts. This pragmatic approach to production has earned FCA respect among some investors. "These guys understand industrial economics better than other people," Adam Wyden, founder of ADW Capital Management, told Automotive News in December. "Why are we going to shut down something that is going to make money, and it's going to make the most money at the end of the product's useful life?" The July death of Marchionne, who set the automaker on the right path after its bankruptcy as Jeep and Ram flourished, poses an unexpected obstacle for FCA. The uncertainty and challenges facing FCA have been reflected in the share price dipping more than $10 since the start of last year. The company continues to trim down, agreeing to sell off car-parts unit Magneti Marelli in a transaction valued at $7.1 billion in FCA's first major deal under Marchionne's successor, Mike Manley. FCA also has been making strides in futuristic technology and diversified powertrains — even if it hasn't moved as quickly as Ford and GM. "Clearly, I think the way FCA is approaching electrification is putting that stuff on as the market demands it," said Wyden, who has been skeptical of big automaker investments in autonomous projects that "might not go anywhere." "I think these guys are just that much smarter than everyone else, yet they get painted with a bad brush." Vince Bond Jr., Urvaksh Karkaria and Michael Wayland contributed to this report.